A former regional daily news editor who “walked across the road” to became the editorial mainstay of a local radio station has died at the age of 83. 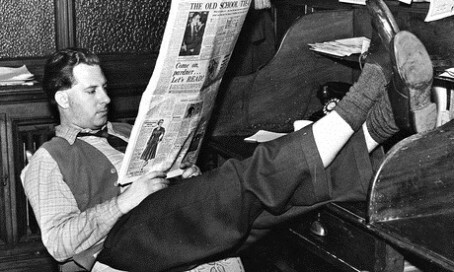 Charles Levitt was in charge of the newsroom in a 12-year spell at the Hull Daily Mail before taking the shortest of career steps – a move to the neighbouring BBC Radio Humberside in 1971. “Be first with the story,” was the mantra by which Charles lived, as he covered everything from trawler disasters to the Cod Wars, the Humber bridge construction through to the arrival of polio vaccines in the city. But his inspirational career was almost dramatically ended almost before it began on his way to work one morning – at the age of 19. He would later recall: “A small plane fell silently out of the sky a few hundred yards in front of me, hit the top of a building tearing off the wings, flopped on to the street, skidded and slid into a shop, shearing off the tail fin. Years later, while at Radio Humberside, Charles showed his total commitment to the highest of job standards when covering a fire in 1978 at Wensley Lodge in which 11 elderly men died. Former colleague Liz Meech told the Guardian: “Singlehanded, Charles talked to police and firefighters at the scene, to survivors and relatives at the hospital, then edited the tapes ready for the breakfast bulletins, hours before the rest of the media. Born in the Cambridgeshire market town of March, Charles went to work at the Cambridgeshire Times weekly aged 15. He moved to a more senior role at the Northamptonshire Evening Telegraph before going to the Humberside region and joining the then Northcliffe-owned five editions a day daily where he eventually became news editor. Charles maintained his “best work” at the Hull paper came in 1961, with the announcement in the final edition of the day that fresh supplies of polio vaccine had reached the city. In 1968, he covered the Hull triple trawler disaster, in which 58 men lost their lives. Three years later he went into radio – only after being assured by the BBC he would “work in news and not on phone-in shows or making jingles”, said Liz. His wife, Shirley, died in 2012 and he is survived by sons, Martin and Malcolm, and granddaughter, Alice. CWL was totally committed to journalism, a towering intellect in his field who chose to exercise his immense talents at a provincial level. He was a great inspiration to all in the Hull Daily Mail newsroom of the 1960s, especially to those who like me were juniors. Charles and Shirley never forgot us and kindly kept in touch until recently. In the Sixties I worked alongside Charlie Levitt in the Hull newsroom, then in 1969 he coaxed me back as his deputy News Editor. His always- inquiring, probing approach to news gathering was a daily douche of vigour to us all (not always painless!) as we worked through a heap of major stories from trawler disasters, Cod wars, bitter industrial strife on the waterfront and breaking down a level of local government awkwardness and secrecy which fortunately today’s reporters wouldn’t believe. His was a Big Chair to fill when he walked across to radio and I was the new occupier! Though colleagues and friends at all times, we slogged it out over the next few years in a mighty news-pride drive… but with the Hull readership and listeners the benefactors. CWL gave Hull a news perception it simply came to expect, but without his diligence and commitment much of it would have passed them by.